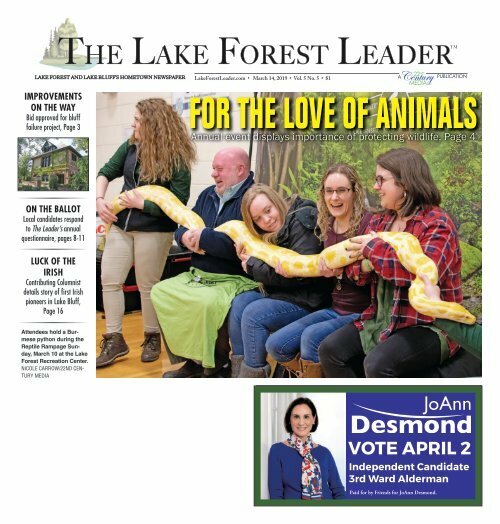 ® Lake Forest and Lake Bluff’s hometown newspaper LakeForestLeader.com • March 14, 2019 • Vol. 5 No. 5 • $1 Improvements on the way Bid approved for bluff failure project, Page 3 The Lake ForesT LeaderTM A ,LLC Publication Annual event displays importance of protecting wildlife, Page 4 On the ballot Local candidates respond to The Leader’s annual questionnaire, pages 8-11 Luck of the Irish Contributing Columnist details story of first Irish pioneers in Lake Bluff, Page 16 Attendees hold a Burmese python during the Reptile Rampage Sunday, March 10 at the Lake Forest Recreation Center. Nicole Carrow/22nd Century Media VOTE APRIL 2 Independent Candidate 3rd Ward Alderman Paid for by Friends for JoAnn Desmond.